White lacquered electrical aluminium loading boom. Multifunction screen : GPS, Chart Plotter, RAYMARINE E1200W digital sounder in wheelhouse. This boat is only 6 years old and still looks virtually new as she has obviously been well cared for. This boat is ideal for a couple who wish to use her as a live-aboard or spend large time holidaying on her. She is intended for coastal work, island exploration and serious cruising. The sizeable saloon has a large bed settee that will convert into a full double bed. This area can then be closed with sliding curtains in order to provide privacy. She is extremely well equipped so ready to go. An extremely nice feature is that the skipper can step out onto the deck having full visibility of the starboard side whilst berthing and still have hands on the controls. 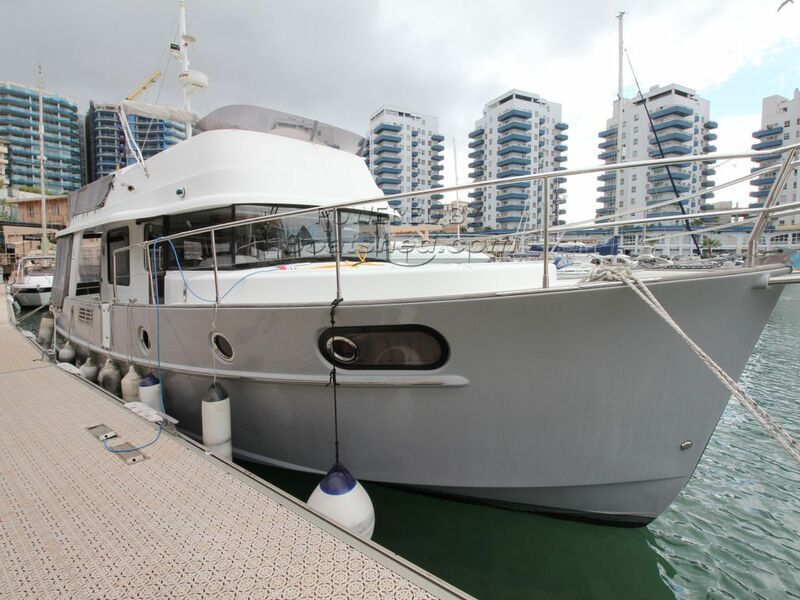 This Beneteau Swift Trawler 44 has been personally photographed and viewed by Andrew of Boatshed Gibraltar. Click here for contact details.